‘A good cast,’ it used to say at the end of the old Thirties’ horror films, ‘is worth repeating.’ As is a good story. Powered by some inspiring songs and explicit LP sleeves US metallers Savage Grace had been a relatively successful act in the early Eighties but ran out of steam in 1992. Seventeen years later S.G. leader Chris Logue set about reforming the band, but finding his former colleagues less than enthusiastic he eventually came across the guys in legendary NWOBHM coverists Roxxcalibur and with them set about creating a new Savage Grace for a new era. Unfortunately, after some successful European dates Logue then disappeared. Instead of just going back home and mowing the lawn Alexx Stahl (vocals), Roger Dequis (guitars), Kalli Coldsmith (guitars), Mario Lang (bass) and Neudi (drums) decided that they’d got too far into the groove to bail out now and with a name inspired by Savage Grace’s debut LP – the one with the grinning motorbike cop and a naked woman chained to his bike on the cover – they set about writing and recording a new album in the vein of Logue’s outfit. Preceded by an EP ‘Knutson’s Return’ (Knutson being the name of Savage Grace’s savage cop) which features a couple of album cuts ‘For Now And All Time (Knutson’s Return)’ and ‘Alliance’ as a taster, ‘Back With A Vengeance’ is the fruit of their labours. 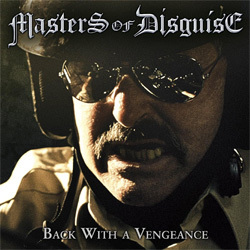 Masters Of Disguise’s debut album is a ten-song set with eight new self-penned originals coupled with two ‘older’ songs in ‘Scepters Of Deceit’ (the band’s first commercially available song which appeared on 1982’s Metal Blade compilation ‘Metal Massacre II’) and ‘The Templars’ Gold’ written by Logue in 2010. The guys’ work with Roxxcalibur shows that they know how to cover a song and bring it into the twenty-first century; but with Masters Of Disguise they’ve had to go one step further and get a feel for how Savage Grace would write and perform and then replicate this style. And you know what? They’ve nailed it, bang on, and the fact that, played blind, you’d be hard pressed to work out which two songs weren’t from the pen of Stahl, Dequis, Coldsmith, Lang and Neudi is the proof of the proverbial metal pudding. Less a tribute, more a homage, ‘Back With A Vengeance’ is the closest thing you’re likely to get to a time machine without coming across Dr Who. With pounding drums, soaring vocals and riffs to die for blended with memorable melody lines and flair – bucketloads of flair – ‘Back With A Vengeance’ captures the true essence of what was then called power metal and beautifully imbues it with a contemporary feel, making it not only relevant to nostalgia addicts but to state-of-the-art metallers too. Frantic and frenetic, the songs whip by is a flurry of runs and breaks, with the rhythm section thundering away in the background: and above it all towers Stahl’s note-perfect voice. This may be the closest to metal heaven you can get, and I could personally leap about like a loon to ‘The Omen’ all day long. And if that’s not enough, not only does instrumental opener and title track show just how much the early Eighties American power metal bands borrowed from the New Wave Of British Heavy Metal but the title itself is a neat nod to Fist’s second album from 1982, which is a nice tie-in to the band members’ NWOBHM leanings. I ask you, what’s not to like?